This is a really easy recipe. The idea first came to me from using Good Seasons Italian Dressing Mix. I wondered how much difference a good vinegar, such as wine vinegar, would make rather than distilled white vinegar. The recipe on the package also calls for water. What about apple juice or lemon juice instead? The possibilities are almost endless. ¼ cup (60ml) vinegar, such as wine vinegar, tarragon vinegar, apple cider vinegar, etc. 3 tablespoons water or juice, such as apple juice, pomegranate juice, lemon juice, etc. Combine all the dry ingredients in a glass jar and store in the cupboard. 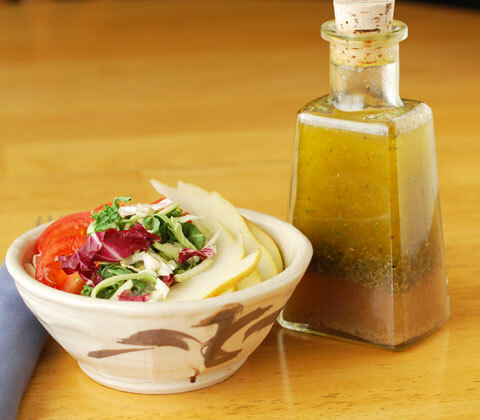 To prepare the dressing, combine the vinegar and juice (or water) in a bottle with 2 tablespoons dry mix. Shake vigorously. Add the oil and shake again. Keep refrigerated. Shake well before garnishing salad.